This Igbo movie in its comic drama nature focuses on Nkoli (Racheal Okonkwo), a timid and local Igbo girl from a very remote village. 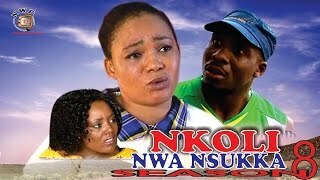 You are now watching the Season 7 of Nkoli Nwa Nsukka Nigerian Igbo Movie showing on Nigeria Movie Network. Starring Rachael Okonkwo, Junior Pope Odonwodo, Mac Collins Chidebe, Lacclass Ozougwu and Uju Ozougwu. The Igbo drama series is brought to you courtesy Nollywood Pictures TV. This episode 6 is the sequel to NKOLI NWA NSUKKA Season 1, Season 2, Season 3, Season 4, Season 5, and Season 6. 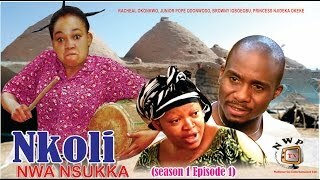 Nkoli Nwa Nsukka Storyline: This gripping story of Nkoli (Racheal Okonkwo) a local damsel continues. Following Nkoli's marriage to Uchenna, a wealthy businessman things turns around for her in the way she never envisaged. Doors of opportunities were opened for her to explore,and the manner which she takes up this interesting challenge that comes her way has much to reveal about her true personality.